Safedoors and Safedoor Scotland have unveiled two distinct new composite door set offers specifically developed to serve markets north and south of the border through dedicated ranges. From the Epwin Group stable Safedoors will supply trade markets in England and Wales, while Safedoor Scotland will supply fabricators and installers North of the border, operating as a completely independent business. Paul Lindsay, director, Epwin Group Extruded Products Division, said: “We don’t believe a ‘one size fits all approach works’ in the composite door market. It represents a growth area but your offer has to be right for the end user and there are clear regional variations which can be very difficult to manage if you’re supplying products on a national basis. Door sets from Safedoors and Safedoor Scotland feature a dedicated fully reinforced 70mm outer frame from Profile 22, a thermally efficient fully prepped GRP slab, full face aluminium hinges and lock plates, a low threshold with twin seals and 98 per cent recycled cill. Buying north or South of the border, doors from the Safedoors Network also achieve PAS23/24 and are fully weather tested to BS6375. All doors are also guaranteed for 10 years from the date of installation. Styles, glass and hardware are selected by Safedoors and Safedoor Scotland independently of each other to reflect differences in end user tastes, climate and regulatory requirements. Safedoor Scotland, is headed by business manager, Chris Connelly. “We’re a Scottish owned, Scottish-run business serving the Scottish composite door market. It’s an offer that we know works and which is already delivering results for a growing number of Scottish installers and fabrication businesses. 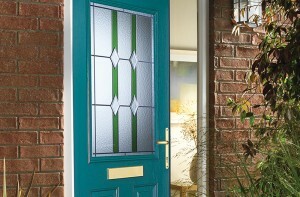 In England and Wales Safedoors represents a new trade composite door offer from the Epwin Group. Delivered through its composite door manufacturing business Permadoor, it draws on more than two decades experience in supplying the social housing sector to deliver a new dedicated trade offer. Alan Calverley, marketing manager, Safedoors, said: “We obviously have a lot of heritage in the composite door industry but the trade range is completely new. We’ve underpinned that dedicated product offer with the creation of a team of trade sales specialists and new customer service centre, there to support our trade customers. For further information on Safedoor Scotland please visit www.safedoor-scotland.co.uk or call 01738 441 565.